Focused and complex, the wine opens with aromas and flavors of black fruit - blackberry, currant, and plum - that slowly give way to layers of nutmeg, rosemary, grilled game, and warm pie crust. This firmly structured and full-bodied wine gains depth and richness through the finish. 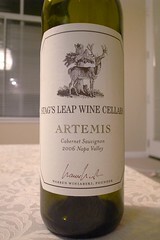 Enjoy this wine with filet mignon with green peppercorn cream sauce or braised veal shanks with green olives and capers.